I was finally going to a cat show for the first time in two years. I got a lift from my friends Maggie and Wayne and also my friend Linda, who came with us to look after me. We took the same cats as the previous show 3 weeks ago, namely Emmy and Eclipse. Both won their CC`s and were made up. I now have Champion Sargenta Silver Emmy (silver Tabby) and Champion Sargenta Silver Eclipse (silver Spotted) Both did well in their side classes. I now have 125 titled cats, 47 of them abroad and the others in the UK. Must be a record and my reward for 30 years of breeding Silver Cats. I really enjoyed the relaxed atmosphere of the show and meeting up with many old friends. The Top winning Overall Best in Show cat was my friend Helen Nicholson`s cat Metallicat Silver William (silver spotted) sired by my stud boy Ch Khancoban Silver Fox. The weather was bright and sunny and we all had a lovely day. 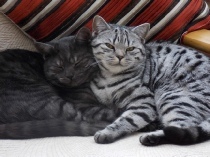 My friend Natalie of Tigatails British Shorthair very kindly took my two cats Sargenta Silver Emmy (silver Tabby) and Sargenta Silver Eclipse (Silver spotted) to the double Championship shows, namely the Southern British Cat Club and the Croydon Cat Club. Emmy was awarded a first Championship Certificate in both shows and Eclipse did the same. They also did well in side classes. The two shows were held at Bracknell and I can no longer travel this far. It was their first show, and at 17 months of age. I would have liked to show them sooner and get them used to it. Both were a little bit nervous, but handled well being placed well in their side classes as well as the breed class. I was thrilled when Natalie brought them home with their lovely rosettes and prize cards. My new computer is finally up and running after my old one crashed in November. The Hard Drive was damaged and it has taken a long time to claw some of my records back. Sadly a great deal was lost. When some of the files were found and put on the new computer,they were no longer customised and a lot of my records especially from Breeders Assistant were different as we had to download BA direct from the net. I could not do any of this and my friend Paul helped me to get things up and running.I had a back-up passport, but unfortunately this was set to back up once a month and not weekly. I was ill a lot of the time during November, December and into the new Year with Heart problems and not really interested in much, especially the computer which I hate with a vengeance, but alas have to cope with it. I am 79 years old now and all the new technology is moving far too fast for me. Getting old is not much fun. It will be 3 years this April since my husband Fred died. I am glad I still have the cats, albeit in reduced numbers. They are my lifesaver and my only reason for getting up every morning. With the help of Carol and Lorraine, who clean the pens every morning, I hope to be able to manage a bit longer. I wish all my family and friends a Very Happy Christmas 2014. This last year has been a mixed one for me with being ill for most of the time. Apart from the Rheumatoid Arthritis my Heart is giving out, and I can only manage the cats with the help of Lorraine and Carol. Sadly I had to re-home most of my cats. Lizz and Matt came during July to finally upload my website, but then I was not able to operate it and still have a lot of learning to do. Towards the end of October my computer crashed completely and the hard drive was damaged. I lost a lot of data as it was not backed up properly. Getting a new computer and downloading everything from the net was traumatic for me, as everything was more up-to-date and nothing at all was what I was used to. My Breeders Assistant files were there, but not the customised forms I have had for years. There is still a lot to get back and new stuff for me to learn. I am 79 now and don`t find any of it easy. My friend Paul luckily lives not too far away in Maidstone, and for many years has been a great help to me. Lizz was busy all throughout the year with planning her wedding, which took place in October. She is looking forward to her new arrival in Spring and I wish her all the Luck in the World. Being a new Mum will be a lot harder than breeding cats. I am hoping to spend Christmas Day tomorrow with my son Derek and his wife Tracey. Boxing Day I will be with my very good and long- time friend Susan Knight and her husband Peter. More foot surgery planned for early next year if this can be achieved. More tests needed before than. It won`t help me to walk any better but maybe will help with some of the pain. I am hoping to have a couple of cats left for breeding next year, but that will depend if I am well enough to manage. I miss Fred who died nearly 3 years ago and being old and mostly very lonely is not much fun. I also miss the cat shows, it was good fun and a lovely day out. I now wish everyone a All the Best for 2015. The computer Power Supply failed & I now have a new computer. But of course, now the Website has to be copied across to it, so I can update the News pages etc. Please see the Kittens Page. At long last I have my website working on my computer. There was a conflict between the old and new site and it has taken forever to iron out the problem, hence no updates have taken place. If there are no further issues ?????? I might now be able to update regularly and look forward to doing this. I have been ill, the garden has taken up a lot of time. I have just put in 600 new plants and it has taken forever. The Arthritis and my age are slowing me up considerably. 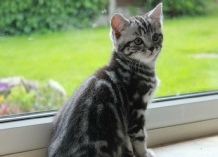 Kittens will be arriving in early June and will keep me busy for the next 3-4 months. Happy New year to all - a little belated but Lizz Benson has been kindly working on a new website for me and its taken a little longer then first thought. I hope you have enjoyed having a look round and I will continue to add news updates and pictures when I can.